Our Buyer Tools section features a series of widgets and calculators specifically developed to help you perform various useful calculations including calculating your potential revenues, profits and more! Each widget comes with detailed instructions on its purpose and functions along with two examples of how to use it. Feel free to call or email us with any questions, feedback or suggestions! This allows you to convert one currency to another using the current exchange rate. Via Trading accepts payments in US Dollars. If you are an overseas customer, please convert US Dollars to your local currency to get an idea of the cost of the merchandise and/or shipping in your currency. We offer a shipping special for customers within 150 miles of our warehouse in Los Angeles. In order to determine if you qualify for the shipping special, please enter your zip code below. More details about our SoCal Shipping Special. The shipping cost per SKU calculator widget is to be used when you are purchasing an assortment of products, and where you would like to allocate (spread) the shipping cost across all products. This helps determine the landed cost on each item in your order. The widget uses the cost of the merchandise as a basis to distribute the shipping cost. We often recommend shipping more than one case or pallet in each shipment. Couriers and freight companies often charge the largest fee for the initial box or pallet they pick up, and a much smaller fee for every box and pallet added to the shipment thereafter. Combining lots and shipping them together is a great way to lower your landed costs. This calculator will allow you to compare an initial quote you receive for one lot, with a second quote for 2 or more lots. Simply enter the cost of the merchandise and shipping in the appropriate spaces, and look at the “savings” section on the right that will display how much you are saving in dollars and as a percentage when shipping multiple lots at once. The first and second fields in this simple profit calculator allows you to enter the price you paid in goods and in shipping in order to determine your total landed cost. The third field allows you to estimate or enter the sales you will or have generated on the purchase in order to calculate your gross profit and gross profit margin. In this scenario for example, the cost of the goods was $400. The cost of shipping the goods was $125. The estimated sales revenue from this purchase was $775. (This is either based on an estimation or the actual amount you sold). The widget automatically calculates and returns your landed cost (Goods + Shipping - $400 + $125 = $525), Profit (Sales - Landed Cost = Profit) and your Profit Margin (Profit / Sales). In this scenario, the cost of the goods was $2,000. The cost of shipping the goods was $250. The estimated sales revenue from this purchase was $3,750. (This is either based on an estimation or the actual amount you sold). 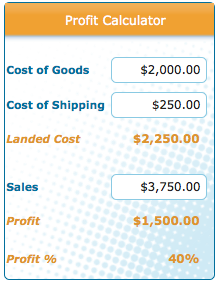 The widget automatically calculates and returns your landed cost (Goods + Shipping - $2,000 + $250 = $2,250), Profit (Sales - Landed Cost = Profit) and your Profit Margin (Profit / Sales). The potential revenue calculator can be used to estimate the potential return you can expect on a customer return load. In its simplest form, you will estimate the percentage of the value of the goods that you will be able to sell. As a second step, you will estimate what you believe you can sell the goods for as a percentage of their value. The graded potential profit calculator is a more complex widget that can assist you in estimating your potential returns on a customer return load. This widget is to be used by more experienced buyers who have worked with these types of customer return loads in the past and know more or less what constitutes different grades of products based on condition and category. The widget is flexible and allows you to “grade” a load by various factors and estimate your potential return based on each factor. The most common way to segment and grade a load is either by Product Category or by Condition. You can either grade/segment the load by category: Premium electronics, clothing, kitchen appliances, toys, food, etc. Or you can grade it by condition: 100% New; Like New; Out of Box; Defective, etc. The Customer Return Profit Calculator assumes % of the load as a % of the value fo the load. It is not referring to % of Load in terms of QTY but in terms of Value. E.g. If your total load is $1,000 in value and includes 1 TV for $800 and 4 Radio’s for $50 each and the TV is sellable but the Radios are all unsellable – then the % of sellable value would be 80% in that case. Click here to add more Items. The Liquidation Load Profit Estimator combines several widgets into one, taking into account your landed cost and allowing you to calculate your estimated profits using either the Simple Calculation or a Graded calculation. To begin – simply enter the total retail or wholesale value of the load, as well as what % you paid for the load. 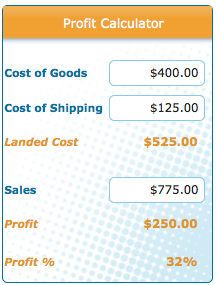 Enter the shipping cost (if applicable) in the Shipping field to calculate your Landed Cost. The widget will automatically calculate your Landed Cost. If using the Simple Calculation – you will prompted to enter the % of the Load that is in Decent Salable Condition, and the % of the Load that is in poor or unsalable condition. You can then enter the % of wholesale or retail value you either estimate to receive or have already received for these items. The widget is flexible and allows you to “grade” a load by various factors and estimate your potential return based on each factor. The most common way to segment and grade a load is either by Product Category or by Condition. You can either grade/segment the load by category: Premium electronics, clothing, kitchen appliances, toys, food, etc. Or you can grade it by condition: 100% New; Like New; Out of Box; Defective, etc. The Liquidation Load Profit Calculator assumes % of the load in terms of $ value. It is not referring to % of Load in terms of quantity, but in terms of Value. For example, if your total load is $1,000 in value and includes 1 TV that has a value of $800 and 4 Radios that have a value of $50 each and the TV is salable but the radios are all unsalable, then the % of salable value would be 80% in that case. Enter the % of the goods you believe will be in sellable condition. If grading by category – enter the product category here. E.g. Premium Electronics, Electronic Accessories, Clothing, Food, Cosmetics etc. Enter % of Value that you believe you will be able to sell that category of merchandise for.